In an interview with Maria Bartiromo of Fox Business Network, President Trump made a number of factually inaccurate and dubious claims. Here’s a roundup of the lowlights. The House Republican legislation to replace the Affordable Care Act was pulled from a looming House vote on March 24 after congressional leaders realized that it would fail to pass by a large margin. There’s no way to spin this except as a failure, especially since passage in the House would only be the first step on a long legislative journey. Senate Republicans generally are cool to the House proposal and are likely to pursue their own path. Then the two versions must be reconciled and pass both chambers before success could be declared. But Trump failed to advance even to first base. It’s true he might get another chance at-bat, but the effort is indeed a failure so far. Trump suggests that he isn’t filling administration posts because of Democratic obstruction. Democrats have slow-walked many of his cabinet nominees, but Trump has been much slower than his predecessors in filling sub-cabinet posts and other positions. Out of 553 key positions requiring Senate confirmation, 478 still have no nominee, according to the Partnership for Public Service. Another 29 have been announced but not formally nominated; only 22 positions have been confirmed. Republican senators have said they are growing impatient with the White House’s slow pace. So Trump really should be pointing the finger at his own staff. Trump continues to grasp on slim reeds to claim he was correct when he falsely tweeted that former president Barack Obama “tapped” his phones at Trump Tower. No evidence has emerged to support that claim and it was denied by Comey. But in recent days he has claimed former national security adviser Susan Rice may have violated laws because she requested the identities of U.S. citizens who were incidentally recorded or referenced in surveillance conducted by the National Security Agency. Numerous former national security officials said that Rice had every right to make those requests. CNN reported that a review of classified documents by both Republican and Democratic documents found no evidence that Rice and other Obama administration officials did anything unusual or illegal. This is false. Trump is mixing up headlines written for the print and Internet versions of the article. The headlines were not changed in any nefarious manner, as Trump suggests. That headline has not changed since it first published. The headline for the print version, published Jan. 20, read: “Wiretapped data used in inquiry of Trump aides.” Writing separate headlines for print and online versions is a common practice. The difference in headlines is always noted at the bottom of the article on nytimes.com, and that note was there since the story first appeared in the print newspaper. In any case, the text of the Times article under either headline was identical. Again, this is a flip-flop. Trump now criticizes Obama for inaction after declaring a “red line,” or Obama’s threat to take U.S. military action if Syria used chemical weapons. Trump continues to falsely claim credit for a host of corporate decisions that had nothing to do with his election or his policies. 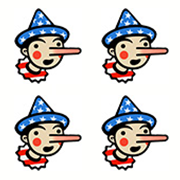 This Four-Pinocchio claim is Trump’s most repeated claim logged in Fact Checker’s database tracking the first 100 days of Trump’s false or misleading claims. We’ve been keeping a running list of corporate decisions that Trump falsely credits to his election or inauguration. Ford’s decision to expand in Michigan rather than Mexico more to do with the company’s long-term goal — particularly its plans to invest in electric vehicles — than with the administration. In January and March, General Motors announced plans to add or keep jobs, rehire workers, and invest $1 billion in the United States. Trump took credit, but the company did not attribute the decisions to Trump’s election.